We invite you to become a member, support our organization and also hope you can join us for one or more events through the remainder of the year. Please check our schedule of events. 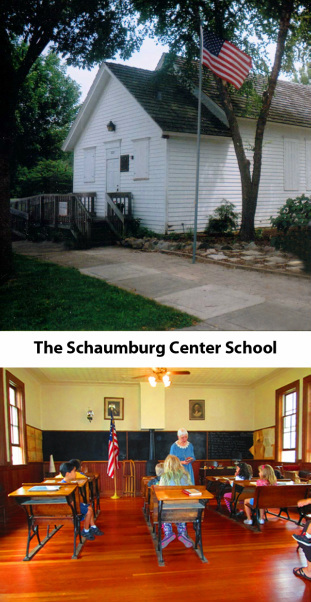 The Schaumburg Center School was one of five public schools founded in Schaumburg Township, Cook County, IL. Originally located on Schaumburg Road northwest of Roselle Road, it was moved in 1981 and restored on its current site on the St. Peter Lutheran Church property on Schaumburg Road. This one room schoolhouse is owned by the Village of Schaumburg and leased to the Schaumburg Township Historical Society (STHS). If you would like to visit the Schaumburg Center school, we have scheduled many dates in 2017 for an Open House to welcome you, your family and friends. If you would like a group tour and program go to our contact us page to the link at the bottom of the page and click on the link. If you fill out the form and activate the submit button, we will get back to you. The STHS meets in the historic one-room schoolhouse and is located north of the old St. Peter Church and the original historic chapel. Enter the driveway at 208 East Schaumburg Road in Schaumburg, IL. Unless otherwise noted on the "Upcoming Events" page, the STHS meets the second Monday of each month from October through June. The meetings begin at 7 p.m. All are invited. Please also check the "Upcoming Events" page for any special programs and alternate meeting locations.